From an early age, Alexander Scardavian (born Alessandro Scardavi in Cesena on February 22, 1974) was constantly surrounded by music. Pink Floyd, Frank Zappa, British blues, the obscure psychedelia of Soft Machine and Amon Duul, the prog masters King Crimson, Orme and New Trolls, and the great soundtracks of Ennio Morricone and Goblin – all brought into the house by his older brother Gilas, the unforgettable vocalist of Paul Chain’s “17 Day” on 1984’s “Detaching from Satan”. Alexander began his life-long fascination with music at age four when he started to play the drums, and continued to develop his interest in the following years when he started playing the keyboards and guitar. The practice room in the Scardavi household in 1981 was regularly frequented by the members of Death SS. As a boy Alexander witnessed the band’s performances, and from them he took an inspiration that has fueled his career since. Death SS’ horror theater, and Paul Chain’s unsettling musical charisma left an indelible mark on Alexander, so much so that Paul Chain soon became his life’s teacher and musical mentor. In 1989 the two started to collaborate regularly, and in 1991 Alexander began his recording career, appearing on Paul Chain’s “Whited Sepulchres”. In the years that followed, Alexander’s artistic relationship with Paul intensified, often accompanying him on tour and appearing on numerous recordings. In 1993 and again in 1998 Alexander contributed to Steve Sylvester‚Äôs two solo albums, both as a writer and as a session musician. The discographic debut of Strange Here (that by now had become his solo project) occurred in 2002 when the “Strange Here?” album was released. Alexander wrote, sang and played all 7 tracks with the occasional help of two session players. At this point in time, due to grave personal problems, Alexander unexpectedly and abruptly withdrew from the scene. In 2006 he met Dominic Lotito, a 20 year-old guitarist from Milan who had played in a few local bands, including the renowned Error Amplifier. The two immediately developed a strong friendship, and started to lay down the foundation of a new version of Strange Here with Dom moving over to the bass. 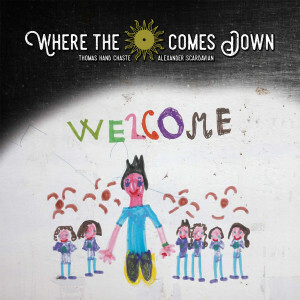 Soon Alexander’s personal situation started to improve and the two started to develop more material with the help of a few studio musicians on keyboards and drums, and in 2013 the pair started to focus more intensely on their objective, notwithstanding the geographical distance that separated them. In August 2014 they entered into the studio with three songs ready and many more ideas. This was the culmination of 12 years of soul-searching and existential uneasiness. 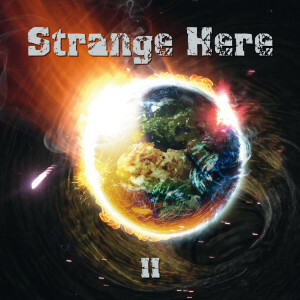 And so the “Strange Here II” came to be, recorded and mixed in 20 hours at Atomic Studios in Longiano, Italy. Recorded live, with lots of improvised meanderings, Alexander’s and Dom’s anger, frustration and suffering over the years was conveyed through intense and obscure music.